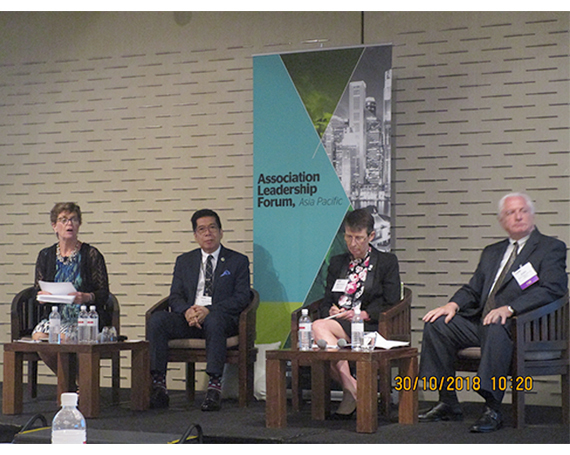 PCAAE, through the participation of its CEO & Founder, Octavio “Bobby” Peralta, was represented in the Association Leadership Forum (ALF) organized by the Washington, D.C.-based American Society of Association Executives (ASAE) in Singapore on October 30-31, 2018. The Forum, which was held at the Grand Hyatt Hotel, was attended by 130 international association-delegates from 43 cities in 15 countries and also by 25 content leaders, 17 exhibitors, and 12 members of the ASAE Asia-Pacific Advisory Task Force. The event is the fourth in a series of annual conferences on association management in different cities in the Asia-Pacific region. Started as the “Great Ideas” conference in 2015, the event moved from Hong Kong to Seoul and now to Singapore where it was reformatted as a “Leadership” conference.